Last October, the U.S. district court for the Northern California District halted a $1.6 million earth science research cruise in the Gulf of California. Geophysicists aboard the Ewing, a research ship operated by Columbia University, had been using acoustic pulses as seismic sources to map the structure of the lithosphere beneath the ocean floor. The court found that the pulses may have been causing irreparable harm to marine mammals (Geotimes, January 2003). The incident came on the heels of several high-profile mass strandings of beaked whales associated, in timing and location, with military sonar exercises. 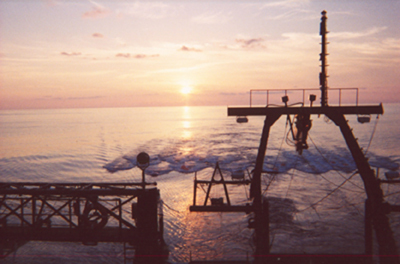 A seismic sound source array drags behind the Ewing in the central Pacific. Image provided by Daniel Lizarralde. Growing public concern over the effects of ocean noise on marine mammals prompted the National Research Council (NRC) to investigate the current state of knowledge on the subject. A committee of acousticians, oceanographers and marine biologists found that surprisingly little is known about the long-term trends in ocean noise, and even less about its effects on marine mammals. Their report, published online February 10, calls for a single federal agency to guide and sponsor future research in monitoring ocean noise and its biological impacts. its recommendations will carry a lot of weight," says Steven Holbrook, a geophysicist from the University of Wyoming. Holbrook was working on the Ewing when the court ordered it to cease operations. Most of what scientists do know about ocean noise comes from Navy research that began during the Cold War, says George Frisk, an acoustician at the Woods Hole Oceanographic Institution and chair of the NRC committee. The anti-submarine effort, driven by concerns about the possibility of missile-carrying Soviet subs, established a network of hydrophones in strategic locations throughout the world's oceans. The hydrophones recorded background noise levels in the sea; noise that could interfere with U.S. sonar. Those measurements found that the two largest contributors to ocean noise are wind-generated ocean waves and commercial shipping. they do not deploy sensors for extensive periods of time in the same spot with the goal to see how it is changing with time." The few studies that have examined changes in ocean noise suggest that low frequency sound has increased roughly 3 decibels per decade in the past half century  most likely from increased commercial shipping. The Navy hydrophones also average the noise spectrum over space and time and so miss transient, localized sounds that may prove more relevant to marine mammals, according to the report. Mid- and high-frequency sonar, as well as seismic signals, produce sharp acoustic pulses with intensities that fall off with distance from the source ship. One of the committee's key recommendations is for the federal government to establish a network of hydrophones for long-term monitoring that focuses on areas of high marine mammal concentrations, and that records transient sounds in addition to background noise. While scientific understanding of ocean noise is limited, research into marine mammal responses to noise lags even further behind, Frisk says. Part of the reason is funding. In contrast to ocean noise, marine mammal acoustics did not present any clear relevance to the anti-submarine effort. "The [marine mammal] efforts tended to be much more of an ivory tower nature, and much less funding went toward them." However the report does summarize research finding that marine mammals cease or change vocalization patterns in response to background and anthropogenic noise. The committee also found the relationship between the recent beaked whale strandings and military sonar exercises in the Mediterranean, Bahamas and Canary Islands to be "quite compelling" and cause for concern. However, it stressed that "there is no clear demonstration as yet of any causal mechanism." Until more is known about marine mammals and ocean noise, policy makers should be careful not to overreact, Frisk says. "The tricky policy issue is not to jump to conclusions that influence policy, that lay up the Ewing, or stop all seismic activity. In my personal view, that's an overreaction based on insufficient data." The NRC report was sponsored by the National Ocean Partnership Program, an interagency group within the federal government that includes the Office of Naval Research, the National Science Foundation, National Oceanic and Atmospheric Administration, and the U.S. Geological Survey. Frisk plans to highlight the report's key findings and recommendations at talks in upcoming scientific meetings. Jennifer Merrill, the study director, has already met informally with staff in the Senate where, she says, the study was greeted with a "moderate amount of interest." The Marine Mammal Protection Act will soon be up for re-authorization, and Merrill expects interest in the report will grow at that time. "In some sense this is still the beginning of the whole issue," Frisk says. "I would anticipate that, while we have looked rather broadly at the whole topic, future committees will focus in on key areas."